One of the more useful clerkships I completed during Medical School was one in Occupational Health. It provided me the opportunity to visit a variety of different workplaces and to learn about the health-related challenges faced by different types of workers. I worked with employees at a zinc refinery, a radiation-contaminated EPA Superfund site, at our affiliated health system’s laundry facility, a soap manufacturing plant, and several other locations. One of the workplace types we didn’t visit was the typical office setting. 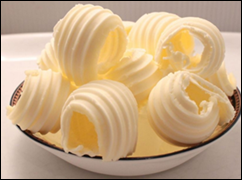 Although we learned about the repetitive motion injuries common in decorative butter-ball rollers, we didn’t learn much about health conditions caused or aggravated by computer use. Since then, we’ve heard more about carpal tunnel syndrome and repetitive motion injuries. In addition to hand-related conditions, those of us who spend the majority of our days in front of a computer can encounter complications of decreased mobility along with symptoms such as numbness and tingling of arms and legs. Headaches, neck pain, and back pain are also common. Although many of those symptoms can be combated by ergonomic interventions, many companies lack the knowledge or resources to pursue special positioning devices, supplemental hardware, or new work areas. I have several colleagues with standing desks and those can make a difference with the mobility issues, but sometimes introduce additional problems when individuals embark on an activity plan that is different than what they have done previously. Risk factors for CVS include working with a monitor that is too close (20 to 28 inches is ideal) or monitor height that is too high. Placing the monitor in a lower line of vision causes the eyelids to be open a smaller distance, which reduces the frequency of dry eye symptoms because less of the surface of the eye is exposed to the air. Having a slightly lower monitor is also supposed to promote neck relaxation. Anti-glare filters are also recommended when glare is an issue. Since computer use is a major risk factor on its own, the authors note that due to the increased use of computers among students and children, symptoms are also present in that population. Many of us in healthcare are highly focused on conditions that inject the most cost (and most comorbidity) into the healthcare system, such as diabetes, heart disease, obesity, and chronic pulmonary diseases. I was surprised to read that the estimated expenditure on eye diseases in the US is $16 billion each year, more than twice spent on breast cancer when you look at another disease to place it in proportion. In addition to the ergonomic recommendations, experts also recommend simple preventive steps, such as taking a break every 20 minutes to stare at an object at least 20 feet away. This recommendation poses a challenge for those of us doing close-up work in an exam room, which is rarely larger than 10×10 feet in many offices. It’s not clear whether switching back and forth between the screen and the patient adds to or helps eye symptoms. Workers with dry eye symptoms can also use moisturizing eye drops. Eye symptoms and musculoskeletal issues aren’t the only things we have to worry about in the modern workplace, especially those of us that bring work home with us or work on highly flexible schedules. It’s been suggested over the last several years that exposure to artificial light at night may be linked to depression. One study in the journal Molecular Psychiatry showed that hamsters exposed to dim light at night over a four-week period had changes in brain chemistry that were linked to depression. The good news is that the effects could be reversed by returning the hamsters to a normal light-dark cycle for a couple of weeks. The fact that the study was done with hamsters made me think about the fact that many of us feel like we’re on a hamster wheel on a daily basis, so perhaps the results are more relevant than we might think. CDC, through its National Institute for Occupational Safety and Health, lists additional challenges in the office environment – temperature, humidity, light, noise, task design, and psychological factors such as personal interactions, work pace, and job control. In the world of healthcare IT, I definitely hear about the latter three. CDC also mentions that “job stress that results when the requirements of the job do not match the capabilities or resources of the worker may also result in illness.” In the world of ever leaner workplaces and job consolidation, there is no shortage of that type of stress. I’d be interested to hear from readers in various sectors about how their employers are or are not addressing occupational health issues. Does your employer encourage you to check your bags so you don’t have to hoist them in the overhead bin? Are you allowed to relax while traveling or are you expected to work with your laptop balanced on your knees because it won’t fit between the tray table and the seat in front of you? Do home-based employees get a budget for ergonomic workstations or at least comfy chairs? Is it better in academia versus industry? Email me. “[E]xperts also recommend simple preventive steps, such as taking a break every 20 minutes to stare at an object at least 20 feet away.” Where have I heard this before? Sounds a lot like breathing technique used during labor – a strategy I’m sure would prove useful to those preparing for/undergoing the “birth” of new health IT within their facility.